Then-U.S. Rep. Mary Bono, R-Ca., speaks during a meeting of the Joint Committee Session on addressing the Nation's Opiod Crisis at the National Governors Association Summer meeting at the Greenbrier in White Sulphur Springs, W. Va., Saturday, July 25, 2015. 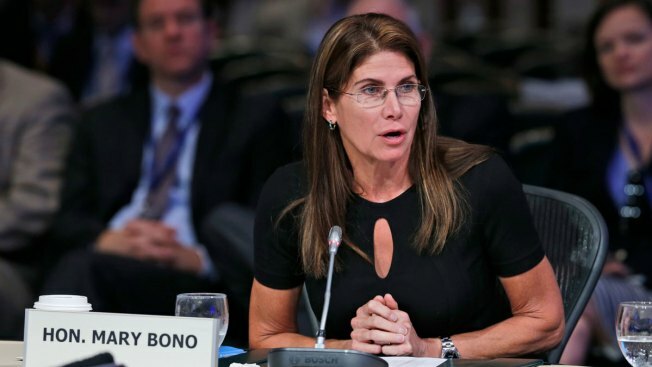 USA Gymnastics interim president and CEO Mary Bono has quickly stepped down — spending just a weekend on the job — following criticism by two Olympic gold medal winners. Part of the backlash against Bono was over an anti-Nike tweet she posted last month aimed at former NFL quarterback Colin Kaepernick, NBC News reported. Bono released a statement on Tuesday announcing her departure, writing that in the wake of her tweet she had experienced personal attacks that "left undefended, would have made my leading USAG a liability for the organization."